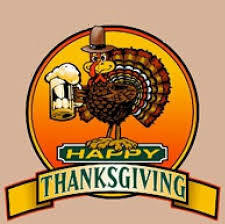 The Tap Room will be closed on Thanksgiving so we can spend time with our Families, but we will be open Wednesday 4-8, Friday 4-8, Saturday Noon – 8 and Sunday Noon – 5pm. Bring your Friends and Family to check out your favorite Spot! Or Stop by on the way to your Feast and pick up a growler, 6 pack or case! Safe Travels!